That is an interesting topic. Declining values in Calif. There are many areas this happens in a significant way. There are other areas this remains temporary to say the least. Quality can determain which way that goes. Grant Cardone invested heavily in Cali. He made multi millions from one personal single family LA home. SEE YOUTUBE. I have not run the numbers officially, but more millions than anything else he ever touched or will perhaps. J. M. Awesome analysis. I am completely inspired to analyse the market cycles now. I am very new to this so please excuse the basic questions. - Any basic information on how I can do this type of analysis? Where/what info did you get? What tools are you using to analyse? Finally I have sometime to get back to this thread. 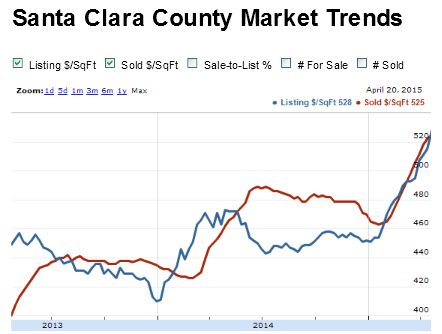 Here is the data for Santa Clara County. Year over Year inventory is down 22%. Home prices shot up 16% YTD. Gotta feel it for the buyers while sellers are laughing all the way to the bank. I shared this with you and a few other BP members off-line a while ago so let me lay it out again to clarify my point about waiting can be costly. At that time, I believe the housing market has another 10% to 15% upside potential conservatively. If history is any indication, the true number is closer to 25% to 30%, but who wants to make that call in 2014 after the massive run up in 2012 through 2014? From an investment point of view, if the deal falls within your underwriting guidelines, you buy regardless of where we are in the housing cycle. As much as timing the market can make you a lot of money, time in the market is arguably more important than timing the market. Say the market goes from 100 to 120 and corrects back to 90-95 in the next recession. Guys like me can pick things up at the courthouse steps for 70-75 cents. Thus, I'm much more selective in what I buy now. However, I will not pass on a deal if I can get it for 80-85 cents on the dollar given it meets my buying criteria in addition to me believing we have another 15% to 20% upside potential. No doubt the decline in interest rates during this downturn has made home prices much more affordable. However, interest rate is a lagging indicator. Its movements, up or down, are the result of our economy. It's an effect, not a cause. With respect to whether the next correction mild or not, we'll have to wait and see if loose lending is coming back. If not, I wouldn't bet on a severe correction. Right now, 30% of purchases in CA is all cash while the average down payment on purchases is 30%. These are solid buyers. I will not be surprised that we do not see a HAI of 40 during the next correction for Santa Clara County. Inventory needs to build up before we see a slow down in price escalation. Otherwise, things will likely remain plateau. So far, inventory is still very low, but we're approaching danger territory in terms of HAI. Tread extremely careful if you're a newbie or an optimist since this might be the beginning of the end of your real estate investment career. 1- keep in mind that high end markets like ours decouple from HAI (to a significant degree during good times) due to existing and out of area wealth coming in. Cash foreign buyers and cash rich successful tech people are prime examples. IPO's have a significant impact on our markets, and there are plenty of Joe Average Engineers (i.e. not company executives) that make a $million or three just being at the right time and at the right place. While for each specific tech worker, WHO wins the IPO game is everything, for us (RE investors) it doesn't matter WHO specifically it is! We know that some lucky people will be making bank from the next IPO, and many will want to buy property here and establish roots. Or rent prime units from us. 2- @Minh Le since you're buying a lot of larger residential (5+ units), how are you hedging interest rates, given that most commercial loans only have an interest rate lock of 5-10 years? For me I'm focusing on 2-4's and now refying (again!) like a fiend, able to pull cash out while still locking in at high 3's to low 4's for 30 years. Since these properties are class A with solid cash flows, they are my bread and butter, and I plan to keep them in perpetuity. And it can't get better with those interest rates! Amazingly about 25% of each mortgage payment is going to principal reduction! So I look at it as two income streams. One is the cash flow for living and cash reserve, and the other is the "forced savings" from the principal reduction, which is now becoming a significant chunk of change every month. I love these long term fixed interest rates, and coupled with long term buy and hold on class A properties, man I see this as the ticket to salvation, that will hopefully carry me through whatever crazy sh!t our economy throws our way. But you can't really have the same strategy with commercial loans that reset. So I'm wondering how you're planning for the long term. Just the other day I saw some data some place which was alluding to the fact that the common wisdom that lower gas prices which translate in spendable cash would result in higher consumption seems to be wrong - most consumers are retrenching! And we know about the amount of cash on corporate balance sheets. I don't care if we have democrat or republican in the WH, mortgage accessibility will indeed be loosened up eventually, leading to higher prices of SFR. The troubling aspect of this is what the above scenario will do to rents... Thoughts, guys? Brian? since you're buying a lot of larger residential (5+ units), how are you hedging interest rates, given that most commercial loans only have an interest rate lock of 5-10 years? For me I'm focusing on 2-4's and now refying (again!) like a fiend, able to pull cash out while still locking in at high 3's to low 4's for 30 years. Since these properties are class A with solid cash flows, they are my bread and butter, and I plan to keep them in perpetuity. And it can't get better with those interest rates! Amazingly about 25% of each mortgage payment is going to principal reduction! So I look at it as two income streams. One is the cash flow for living and cash reserve, and the other is the "forced savings" from the principal reduction, which is now becoming a significant chunk of change every month. I love these long term fixed interest rates, and coupled with long term buy and hold on class A properties, man I see this as the ticket to salvation, that will hopefully carry me through whatever crazy sh!t our economy throws our way. Amit, all of our loans are 5/1 ARM with a 10-year balloon. Terms are 1-month LIBOR + 2.25% margin. If history is any indication, this should give us ample time to refinance within the 10 year period. At 3% interest, 40% of the mortgage payment is going to principal reduction. We ran our risk model and are willing to accept the interest rate risk. It's too pricey to pay for a 10-year fixed. So there's a price to pay for security (fixed mortgage). Ironically, the more I analyze, the more I like ARMs over fixed mortgages. Liquidity is the name of the game. @Minh Le okay, I can see that strategy's logic. You're paying off a lot of principal early on, which is always good. And of course you're watching rates, so even when they start rising, it'll most likely be slowly. Then you can decide when/if to refi. It's a good strategy when you're willing to take a bit more risk to leverage and acquire more property. At some point in the future you'll probably deleverage and keep some free and clear, or low balance. Most well off investors take cards off the table to secure their best properties. What has your experience been talking with investors a few steps beyond us on that matter? In my scenario it makes sense to keep everything I have long term, so the 30 year fixed is a nice comfort factor for the long run. Plus I'm not sure how more I plan to acquire in the future. It all depends on one's end game. For me being in the several million category gives me (and my wife) everything we need, and then some. Plus I can self manage it all, and keep things streamlined and lessen my liabilities long term. The next category of wealth, say 10-20 million requires a lot more leverage, more properties, more risk and infrastructure to manage them, etc. I don't need to own multiple sports cars, a yacht, etc (but we do want a second home overseas, live overseas part time and have full control of our time. And maybe a fancy view home in SF. Maybe.) Nor do I aspire to be a well know 'rich guy' in my local community and be obligated to all sorts of social events, etc., I'd rather keep a low profile and have people leave me the F*** alone :) It's really important to have your investment strategy drive your life goals and aspirations. Making money for money's sake is a vapid endeavor IMO. The smart investors that endure know when to take some chips off the table and have some deleveraged blue chip properties in their portfolio. If I read this right, it uses Median Family Income from the Census when available,when not available, it uses the Necessary Monthly Income, which is actually calculated based on the current mortgage rate. Thanks J. Really appreciated the in-depth analysis. Nice graph too, wonder what you use to produce these graph. A stock market can crash overnight, but real estate market usually gives early warning signs before crash happens. Before the 2008 crash, the market had already started the correction in 2006. To those pay attention, a well-timed exist wasn't too hard. Also, there is a reason for the average property cycle to be about 10 years. It's our nature to forget about the history. But we do remember things that just happened to us. It'd take us awhile to forget that. @Minh Le @Amit M. J. M. Is this a SFR thing, or does this also happen in the larger multi market? Based on my experience, the listing price is the leading indicator. Sold price typically lags 2-3 months. As Ben mentioned, it has been across the board. However, I noticed the apartment market was the last one to go up during this cycle in my market. It looked like SFH rebounded first followed by townhomes and condos, then apartments (multi-units). Of course, this is only an observation from one man in one market. Please take it with a grain of salt. @Minh Le Just so I understand... Are you saying the lag time is in the process/recording of the sale? Or is this more the list price is driving the sales price due to buyers offering list? Are you saying the lag time is in the process/recording of the sale? Yes. Listing price tells us where we are currently in the market. Closed sales reflect where we were 2-3 months ago. Fannie Mae/Freddie Mac High Cost area limits are the same as FHA for 2015. VA is the same as FHA for 2015. FHA and VA are owner occupied and have to be mortgage 1-4. Conventional can be both owner occupied or investment with up to 10 mortgages. I am not in the Bay but have family all over and try to pay attention. My SF insurance clients are older buy and hold investors that barely pay attention to the dips as they are not buying or selling. How hard were the more desirable areas hit? Marin County, parts of SF and the Peninsula barely budged from what I could see. I saw huge fall out in the CV and the fringe communities (Vallejo, Mountain House, etc) but the core neighborhoods saw more of a dip than a crash. If my goal was to buy in a place like Atherton, Los Altos, Los Gatos, Sausalito, Tiburon, etc I would buy now and know I may need to hold through a blip of a downturn or a flat period. Buying and holding in the Bay will always work... It just depends how long you will have to hold. The money is some of those communities is insane. The art and jewelry schedules are occasionally more valuable than the house. If I were going to gamble on a transitioning neighborhood in SF, Oakland, Richmond, or a big tract house in Dublin or Albany I would consider waiting for 2020/2021 which is my guess for the next dip. Just my guess. I'm not sure how "investors" still play in the SF market, that is unless they bought years ago in which case I applaud you. Isn't the goal to buy low and sell high? Buying high and selling a little higher seems pointless. There are way too many retail buyers to compete with to give any investor any room to work. Back of the envelope math, what kind of rent can you collect monthly on that $2.35M duplex + $150K in renovations? My guess is at best around $12,000/mo with each renting at $6,000. PITI is roughly $14,000/mo. Nice investment, net loss of $2K/mo not even including cap ex, management, etc. SF Bay Area is very solid and a complete blue chip so it's not going to depreciate pending a crisis but buying with appreciation as the goal (and not just gravy) isn't a good bet. How much better could you do with the $2.5M on a 40 unit apartment building in Florida or Texas? Someone is still making money in SF but it eludes me, I'm going out of state. @Ryder Meehan that is the exact question I have been asking myself for the last several years. Texas vs. SF Bay Area. The best I can come up with is they are very different markets and you can make money in either. Running some scenarios has me about the same in either with a given amount invested. My current opinion is that California is a buy and hold and Texas is a cash flow play. Taxes play a big role in that . Thanks for the post J.Martin so that amateurs like myself can see how far we have to go on the real estate learning curve. More books and meeting for me. @Ryder Meehan I did a quick post on a comparison between the two cities. Started a new post so I don't derail this thread too far. Hello everyone. It has been a year since this thread was updated. I was curious what the observations for the past year and predictions for the next year. But I am not seeing any slow-down in my local subdivision in Fremont, where town homes are being sold for 30-50K above asking without contingencies. How are things looking in your neck of the woods. Funny, I was just looking at this thread. I took an article home from one of the papers yesterday that showed confidence levels in this regard. Things weren't as rosy as they have been recently. I live in Moraga and prices there are IMHO- INSANE. My job is in Oakland and I hope to stick with it a while but if prices don't adjust in the next few years, we will be forced to move out of state or to the valley with a 2 hour commute. My personal prediction: A major readjustment/ mild bubble burst not as severe as 2008 by 2019.